High quality Bleach safe towels at very competitive low price from Towel Super Center. 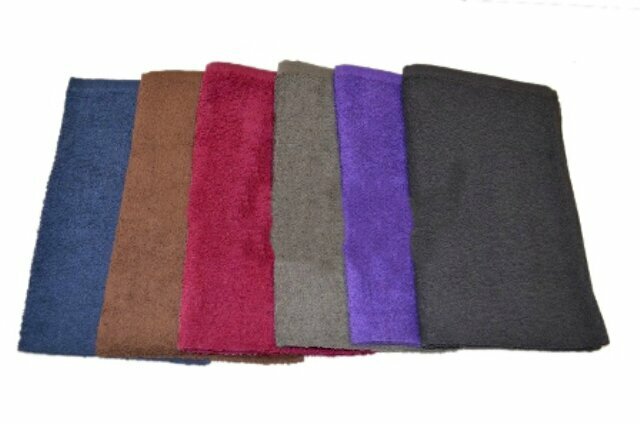 These towels are available in size 16x26 and are excellent for hair salons and other businesses looking for color safe towels. Whether the theme of your salon features blues, burgundies or other colors, we have the perfect bleach-resistant salon towels for your needs. These 16-by-26-inch towels are the perfect size for all salon uses and will last you and your team from morning until night. Why invest in towels that won't work as hard as you do when you can invest in wholesale towels you can depend on? Order the right amount of wholesale bleach-safe towels at amazingly low prices from Towel Super Center right now. Remember that the more towels you order, the less you pay! Each "unit" of salon towels contains 12 cloths, so make sure to consider how many you'll need in one day as well as enough to cover between laundry days. Where else can you get 100-percent cotton at such a fantastic rate? Let's face it — bleach and products that take the color out of fabrics are an essential part of salon life. From hair dyes to nail polish removers, your team members and customers constantly deal with ingredients that have the potential to bleach normal towels. That's why you deserve the benefits that bleach-resistant salon towels bring. Our wholesale bleach-safe towels are treated specially to withstand bleaching. No more spotting, splotching or fading, even if you drop a navy-blue hand towel in with a white load of wash. Although no towel can be completely safe from bleaching due to extreme chemicals, ours give you the reliability you need. Imagine the relief you and your team members at the salon will feel knowing you don't have to be concerned about using bleached or spotted towels on your customers. Customers will notice your hand towels have a just-like-new look and feel — and their appreciation will take the form of more appointments and services requested. What could take your salon to the next level in terms of branding and marketing? How about adding your logo or initials to your brand-new bleach-resistant salon towels? After purchasing your 100-percent cotton wholesale towels, simply find an embroidery shop near you to add your business information. You'll love the way they spotlight and showcase your salon to everyone who receives services. Plus, you can give them away at special events or holidays! Treat your loyal clients to a Christmas gift that bears your name and provides a use for them in their homes. Upon your request, we can even drop-ship your units of bleach-resistant hand towels to the embroidering company of your choice. Just tells us where to make the delivery and we'll ship them right to their door! Your embroidering company will then contact you for an expected finish date and when best to pick up your newly designed towels. Odor-Resistance: Bleach isn't the only thing being resisted! Cotton is often favored for its odor-resisting nature. Especially when you're using chemicals on a customer's hair, it's important for the smell of the bleach to wash away and not cling to the towel. Thirstiness: Your clients will appreciate only needing one towel to absorb the water used during the initial hair washing process. Because the cotton fibers are so thirsty, you can also clean up any spills you may encounter with minimal excess cloths. Fast-Drying: Cotton dries rather quickly, whether being tossed in a commercial dryer or left on a line to air-dry. Wash one salon towel or wash all 30 together — the drying process is the exact same! Softness: A client's satisfaction doesn't only stem from the service you provided them with. Many clients will think about the whole process, and that includes the materials and products you use. They will appreciate the softness of your salon towels, thanks to the 100-percent cotton threads! At salons, hand towels are used throughout the day. You may do several loads of laundry to keep everything clean and warm. No matter which type of washing detergent you use, you'll discover that these bleach-resistant hand towels keep their shape and color. For best use, try not to add fabric softener, which can take away some of the natural thirst of the cotton fibers. Throughout the weeks, you can expect your hand towels to remain fluffy without pilling. It's exactly what you need at a wonderful price! The softest bleach safe towels, we have bought bleach proof towels from other companies but these bleacho towels are the best so far. we buy these bleach resistant towels every time we need more, great absorbent towels, completely safe to bleach!